It is always a bad sign when the main talking point after a GP is a stewards' decision, rather than the race itself. In Valencia the race was so processional that a glaring inconsistency in application of the rules was bound to hog the spotlight - F1 Fanatic's article on the matter of Massa's release into the pitlane as Sutil was approaching is running at 94 comments as I write while other posts about the race receive less than half that quantity. As usual, Alianora has provided the clearest insight into what the rules actually say; emotions run high in many other comments and frequently the point is lost in the inevitable war of words between Ferrari and McLaren supporters. Like anyone else, I have my opinion and am driven to explain it here. Oh, you lucky readers! It seems clear to me that the main bone of contention is not the rule itself but the inconsistency of the FIA stewards in applying penalties for it. Unlike many of F1's complex regulations, this one is a sensible and essential rule - clearly, drivers should wait to emerge into the pit lane after a pit stop until there is no danger of a collision with another car. Massa was released by his team at the exact moment that made a collision with Sutil likely and the rule was infringed upon. The stewards agreed that an offense had been committed. There is little point in arguing over the actual infraction, therefore - the rule was broken, now what are the stewards going to do about it? And that is where the problem lies. The first point to be made is that the stewards elected not to investigate the incident until after the race had ended. In the climate of suspicion of the FIA's partiality, this was unwise, to say the least. As has been mentioned many times, a similar offense during the Valencia GP2 race was dealt with immediately by the imposition of a drive through penalty; it is difficult not to suppose that the stewards wanted to see the result of the F1 race before deciding on the penalty, therefore. I have written before about the undesirability of delayed penalties that affect the following race so, naturally, I am going to be in favor of offenses being penalized within a few laps of their occurrence. It should not be necessary for such decisions to be delayed unless there is real doubt regarding the incident or it occurs very late in the race. Massa's release was so obviously dangerous that I cannot see there being any question of the rule not being broken. As Alianora has pointed out, the problem then becomes one of choosing between the four possible penalties laid down in the regulations. In fact, had the incident been dealt with promptly, there would have been only two choices, either a drive through or time penalty. Neither of these were available to the stewards when they eventually sat down to discuss the matter. That the stewards then chose to impose a penalty that was not included among those available under the rules, underlines the fact that they were not interested in dealing with the offense in an equitable manner. The suggestion has been made that McLaren would not have been allowed to escape with a small fine had they been in the same position; that is speculation and not really relevant to the incident we are talking about, however. Once again, I am led to the conclusion that the FIA will always favor Ferrari in controversial matters and will happily tinker with rules and regulations to keep the championship competitive. We call for consistency in application of the rules and standard punishments but, even when the rulebook is clear, it can be disregarded by the governing body. How this situation can be allowed to continue in an international sport with millions of dollars at stake I do not know. Naturally, I will be accused of being concerned only because I wanted McLaren and Hamilton to win the race and my protests that I want to see justice done will be ignored. Such things happen when we allow our support for one team or another to cloud our view of things. I think Vettel should have been penalized for his ridiculous dice with Alonso down the pit lane in Hungary - where is my assumed partiality in that? Anyone who cares at all for the sport, rather than a particular driver or team, must surely see that it is intolerable that incidents are dealt with by the stewards in so haphazard a manner. This has gone on for years and should have been stopped long ago. If it means that one team runs away with the championship, then so be it - we have had years like that in the past and F1 has survived it. Your comments are, as always, well thought out and insigtful. I am, however, of the mind that punishing Massa with a drive-through or time penalty for the rule violation would have been unfair. Not only was he not personally responsible for the violation, he backed off when it came to crunch time to avoid hitting the pit out wall. I just think that he handled the situation in a mature, fair manner and that a penalty that would have taken away a well deserved win would have been monsterously unfair. It will come as no surprise that I totally agree with you Clive. I don't understand the logic that many people all over the net are using that Massa should not be punished because he was driving well or because he deserved to win. The point is the stewards decided that what happened was dangerous therefore one of the four optional punishments should have been applied and common sense says it should be a drive through. During the race I was commenting at sidepodcast and as soon as they announced that their decision would be made after the race I posted that they planned to give Massa a 10 second penalty because they thought he would pull out that kind of gap. Clearly McLaren thought the same because they got on to Lewis and told him to keep the gap down. The fact Massa tried and failed to maintain this gap had two effects. Firstly the stewards had to either impose a 'legal' penalty which would either cost him the race or give him a 10 place penalty at Spa or invent a new penalty. As ever when the FIA invent a new penalty or ruling Ferrai benefit. The second effect was one that the FIA did not realise and probably still haven't figured out. Hamilton's engine was on its second race so it didn't matter if he ran fla out till the end. Massa's was on its first race so it now has to go to Spa after having run hard till the end of the race so he may end up losing a lot more than a drive through would have cost him unless Ferrari can fiddle a new engine. The fact that the team and not the driver was responsible is utterly irrelevant. The driver and the team are one and should never be separated. The driver does not change his own tyres or refuel his car. I know Max has done it in the past but it is plain wrong. I'm inclined to agree, Clive. However, to play devil's advocate for a moment, it could be argued that Massa gave way to Sutil coming out of the pits - something that none of those penalised during the GP2 race did, and therefore gained nothing from his team's decision/mistake. I'm also ever so slightly inclined to go easy on Massa simply because he was so damned unlucky in Hungary - though of course that shouldn't really have anything to do with the stewards' decision. F1 pit stops scare me with so many people working on the cars, fuel being added, and very narrow pit lanes. Funny, Bernie demands amenities for hospitality and allows multi-million dollar cars to pit on pit roads that really are too narrow to use. I have to agree because Felipe pulled over before leaving the pit lane and made no contact with Sutil, there should be no penalty in this case. I also think F1 needs to look at pit safety a bit more. With fuel being added to the cars and 25 mechanics per car, it is a recipe for disaster. What an incredibly boring race. Nothing happened, absolutely nothing except two pit-stops which were bad and happened to be Ferrari ones. Don: I do not see the relevance of Massa's quality drive to the incident. Rules are rules and this one was clearly infringed against. What is the point of making a rule if, every time someone breaks it, we have to sit down and see how well he was doing in the race, whether he "deserved" a penalty or which particular member of the team was responsible? the less human sentiment involved in applying the rules, the fairer for everyone they become. Would the stewards have delayed their ruling until after the race had Massa spun five times in the race and been in 15th place? I think not. He would have been given an immediate drive through penalty and that would be that. The delay was obviously a move to see just how much their decision would affect the outcome of the race and it is unacceptable for that reason. No rule should be administered with a view to who the driver is or what position he occupies. Would it have been fair to give Massa the penalty for what what was a team error? Yes, it happens all the time in motor racing and is the inevitable result of it being a team sport. Massa happily accepts the points he gains as a result of driving one of the best cars - the downside is that he must also suffer the consequences of mistakes that the team makes. The steward's actions actually devalue Massa's achievement. As long as there is a suspicion that the officials collaborate to ensure one team has an advantage over the others, any wins by that team must be suspect too. In my book, this is a victory that Massa and Ferrari were gifted by corrupt officials. Had the win been achieved despite a drive through penalty, then I would applaud. Steven: It is a shame that those who care for the sport are having to think of such things as engine reliability to gain some crumb of comfort from a (pretty boring) race spoiled yet again by incompetent and apparently partial decisions by officials. These are the issues that are making a mockery of F1 and they seem to get more blatant as time goes on. It is no wonder that so many ardent fans have given up watching in their disgust. Haplo: Agreed. It is almost ironic that one of the good rules should have been so twisted by the officials to suit their agenda. It must surely be irrelevant what actions Massa took to decrease the effects of a violation of the rules after it had happened. The offence was in releasing Massa at a time when such an action could lead to a collision with another car; what happens thereafter is not the point at all and should have no bearing on the penalty chosen for the infraction. Aracer: Effectively, you are saying that infractions of the rules should only be penalized when they cause an accident. As I replied to Patrick, once a rule has been broken a penalty must result. The idea is that we prevent accidents, rather than get annoyed when they happen. The importance of this particular rule is that it is designed to minimize the risk of collisions in the pit lane (an area where, as you say, there is very little margin for error). When teams infringe upon the rule, they have to bear the consequences or we are accepting situations that endanger human life and limb, only penalizing after the damage has been done. Pootle: I must admit that I agree with you completely. After the promising early stages of the build up to the European GP, this turned out to be one of the most boring races of the season. It seems that F1 must rely on safety car periods or rain to enliven things, almost entirely as a result of the aerodynamics allowed on the cars. Next year the regulations are changing in the right direction. I can only hope that this makes enough difference for dry races to become exciting again. What I am saying is let's settle things on the track one way or another. Settling things in the Board room gets old for the fans. Have pit lanes wide enough for two lanes. You enter the closest lane and move over to the outside lane as soon as clear. Outside lane gets the right of way when side by side(inside lane yields and gets behind the car in the outside lane). Then another car can pull out into the inside lane and fall into line. One should only be in the inside lane for entering and exiting their pit stall. Allowing the teams themselves to police the release of their car is subjective at best. Ferrari would not yield to Force India or any other back marker for that matter. So, why ask them too? You think, Lewis and McLaren would yield to Force India in the last race of the season with the Championship on the line? Create a system where that decision is not needed. Having one team 'wait' on pit road is not racing, it's courtesy. F1 demands more space to entertain sponsors then they do for a safe pit road. I'm in full agreement with Clive and Steven (which is usually a good place to be). When one of my friends who doesn't follow F1 closely texts me during the race saying "I bet they would have penalised McLaren" you know that something is wrong. That's not to speculate that they would have, just that inconsistent application creates the opportunity for such speculation. Aracer: That would be an excellent system, I think, and fairest to everyone. Only problem would be that there are some tracks where a dual lane pit is just not possible (Monaco being the obvious example). But I cannot agree that any team should be expected to give way to another in the pit lane. This is a safety issue and a team's pride or ambition of no importance therefore. One rule for all, I say. F1 Punter: Absolutely, inconsistency is the problem, never mind the wisdom of any of the rules. ”dangerous”. Obviously, some team, most likely running silver cars, protested, so the stewards were forced to "investigate" and "punish" the "offenders”. Clive, I believe I worded my sentiments poorly. It would be unsporting of a lapped car to hold up the leader on the track, regardless of which team they run for. You have the leader running 1.0 seconds faster then the 14th place car, it is then unsporting to hold up the leader for very long. It would have been very good sportsmanship to let the leader come out of the pits ahead, since you are just going to let them by(or get passed) on the track anyway. It does not matter whether the Ferrari, McLaren, or BMW is the leader at the time. A 'lapper' should not hold the leader up for long. Unfair application of the rules occurs in many sports, You know Michael Jordan got away with more than a rookie would, same with David Beckham. Ferrari gets away with more than other teams for two reasons: they have more history (and I think, fans) than any other team; and they nearly always support the FIA against the other teams. Race stewards will make poor decisions as long as they are venue stewards and not professionals. In NASCAR, Mike Helton has the final say and everyone knows it, the IRL also has a chief Steward who makes these rulings at every race. The same person is always in charge, and if you don't agree with his ruling too bad. F1 needs professional stewards. Tony Scott-Andrews was the permanent steward until the end of last year and until then Max's plan seemed to be to gradually drop the other stewards and have three permanent stewards. This is something I have wanted for 20 odd years. At the start of this season Tony Scott-Andrews mysteriously retired or was retired. Had it been a planned event it would have been announced after his last race. Max then announced that we were going to have three 'neutral' stewards at each race selected from a pool of stewards. These stewards are neutral because they are not allowed to be from the same country as any competing driver. In addidtion Max announced that Alan Donnelly would be appointed to 'help the stewards reach speedy decisions'. Rather ironic given this weekend's decision process. So he took away the permanent steward and put in place 'neutral' stewards and put his boy in to encourage them to make the correct decision quickly. Mr Donnelly's background is interesting to say the least. He used to run a PR company which did work for among others FIA, FOM and Ferrari. For reasons that no-one thought to explain shortly before his appoint the website of the PR company removed Ferrari from the list of companies they had worked for. No other change was made to the list. Clearly regardless how you interpret the Massa/Sutil incident you must believe we need consistent interpretation of the rules and that means having permanent stewards who can be held accountable and not people who by definition cannot come from major motor sport countries and therefore cnnot have the level of experience that people from those countries bring. Green Flag you rinterpretation is wrong. As soon as the stewards said the incidentwas under investigation they did so because it was dangerous. There is not a shred of evidence anyone protested but as usual the tifosi reaction to anything they don't like is to blame McLaren. You really ought to get rid of the McCarthyism complex. Driver reflexes have nothing to do with the incident. It is the team's responsibility to safely release their driver and in the eyes of the stewards they did not do it. The stewards then decided to wait until after the race before assessing the penalty for the offence which means it is possible for them to manipulate the result. If the possibility exists then people will interpret the possibility as being manipulation. After creating the possibility for manipulation of the result they then invented a penalty that is contrary to their own rules. The rules allow four possible ppenalties for the offence which the stewards said had been committed. They can give a 10 second stop and go penalty, a drive through, a 25 second time penalty or they can give a 10 place grid drop at the next race. My only objection is that the stewards decided that an offence had been committed and then not only didn't follow normal procedure to assess the penalty at the time but in the end invented an entirely new penalty. Anyone can see it is wrong to invent a new penalty. Whether or not anyone thinks an offence was committed is not the issue. The stewards did think the offence had been committed and then tore up the rule book and made up new rules on the fly. Utterly unnacceptable and utterly deplorable. The penalty imposed was of little value to dissuade this sort of action in the future. 10 000$ is nothing, and according to the majority of conflicting reports is IMHO applied to the wrong person, Massa. Massa saw green and went. The error was releasing the car. Whomever controls the lights, spotting for cars in the pitlane, was responsible. While a fine to this person would be in order, it would be simpler to issue a fine to the team as a whole. Further, a 500 000 - 1 000 000$ fine should have been applied, something that would have sort-of smarted. I guess now the FIO/FOM has to develop some sort of un-parking assist technology to get the drivers out of their pit-box safely. Steven Roy: We both know that if it had been Hamilton, not Massa, and the stewards handled the matter exactly as they did for Massa you and the rest of the gang of Ferrari bashers would not have uttered a word. As I said before, the stewards got it right but since their decision did not harm Ferrari or help McLaren you're unhappy. Typical sore loser attitude. You are right to take the tack you did. When you can't argue the case on the facts you throw mud. Very McCarthy. So I assume this means that you don't see a problem with Max's appointment to 'assist' the stewards being someone who was once making money from a competitor. You don't want consistent rules. You presumably don't want experienced permanent stewards. You are quite happy for rules to be made up on the spur of the moment. And of course you have no evidence whatsoever that anyone protested but you are prepared to slag McLaren off regardless of evidence. Whether or not I think what Massa did was dangerous is not the point. Whether or not it was Massa in a Ferrari is not the point. The problem and it is a big, big problem is the stewards decided that what was done was dangerous and then totally ignored the rules. Focus on that point and tell me why it is a good idea to invent new rules after a race.. I must agree with Lonny that F1 needs professional stewards who understand the rules and their application. Aracer: I think the suggestion that it would be sporting for a no-hoper to give way to the leader in the pit lane is not only dubious but also impractical. Sutil has said that he was unaware of Massa's car until it was right next to him - how could he have "sportingly" allowed Massa to go first in that case? The plain fact is that the pit lane is not for racing and the cars should not be allowed to drive down it two abreast, regardless of its width. I was amazed that no one made a fuss about Raikkonen and Kubica doing just that in Montreal. The more space possible between cars driving down the pit lane and the mechanics preparing for a pit stop, the better, and it should be made clear that traffic in the pit lane must be single file at all times. Perhaps you are correct Clive. When Sutil did notice Massa was side by side, he has a decision to make in a split second. Have Massa fall in behind him or give way on the leader on the track. In the name of safety, perhaps having Massa fall in behind him on pit lane is best. He then is still faced with having the leader right behind him on the track. At that point, he must either run competitive laps to the leader or yield to the leader. I respect Massa for not pushing the issue and causing an accident on pit lane. Steven Roy: Many racing situations are subjective and open to various interpretations, so the stewards necessarily have to make judgment calls. That’s not inventing new rules, but coming up with appropriate decisions. What is important is the evenhandedness of their application. As long as anyone who commits the same “offence” as Massa, in the same race, is treated the same as Massa then all is fair and the stewards have done a good job. Since there were no similar occurrences during the race we cannot assume that Massa/Ferrari were in any way favoured. I know you believe that the stewards treat other teams less favourably than Ferrari, but that reflects more on your biases than the stewards’. Certainly, experienced permanent stewards would go a long way to achieving consistent, evenhanded rules interpretations. On the track, many risky moves are made by drivers passing one another. No one is EVER reprimanded until there is some sort of contact with another car. A risky passing maneuver that succeeds is 'a brilliant pass'. Yet, the same maneuver resulting in contact earns the driver a consultation with the stewards. In sports, we often say...."no harm, no foul'. Heikki Kovalainen got a penalty in france for holding up Nick Heidfeld in the French grand prix, even though he had nowhere to go and even though Heidfeld still managed to qualify. At Valencia i saw the same thing happen to Heidfeld yet no penalty was issued. We all know had Massa been driving a Mclaren he would have got a drive-thru. The rules are supposed to be the same for all races. The fact no-one commited the same offence at the same race is utterly irrelevant. If Hamilton commits an offence at one race and gets a trivial punishment and then Massa does exactly the same at the next race and gets banned for three races is that OK with you? It is certainly not with me regardless of what you think my bias is. Regardless how you look at it the stewards did invent a new rule at Valencia. The rule that they said Ferrari broke has four possible penalties listed against it. 10 place grid penalty at next race. Those are the punishments the FIA allow for the offence they said Ferrari committed. THe stewards invented a penalty that is not in their rules. THat has nothing to do with my biases. That is fact. Go read the rules if you don't believe me. No harm..no foul is not ever a good idea in F1. Let me give you a no harm..no foul sequence. Nelson Piquet hit the wall at Tamburello. No harm was done. No action was taken to make sure no-one else could hit an unprotected solid wall. Gerhard Berger hit the wall at Tamburello and his car burst into flames and burned live on TV for 30 seconds with him not moving and everyone convinced he was dead. No action was taken to make sure no-one else could hit an unprotected solid wall. Senna hit the wall at Tamburello and died. Action was taken. Had action been taken after the Piquet accident Berger would not have burned and Senna would be walking about today. We have a speed limit in the pits today because people followed that same logic and eventually I think it was Michele Alboreto's car that came into contact with mechanics. So when do you decide harm has been done and enforce the rules that already exist? When two drivers collide. When two drivers collide and someone loses a championship. When a car bounces off another and into mechanics. When they kill people. Or do you take the sensible line and stamp it out before any harm is done? Every driver who gets into a racing car at any level knows that there are risks and is prepared to take them. As far as I am concerned as someone who did a little racing it is OK for the people inside the cars to take risks and to a certain extent to be put at risk. It is not OK for anyone outside of the cars to be put at risk. You are comparing a drivers split decision with that of track configurations/safety decisions made by people other then the drivers. 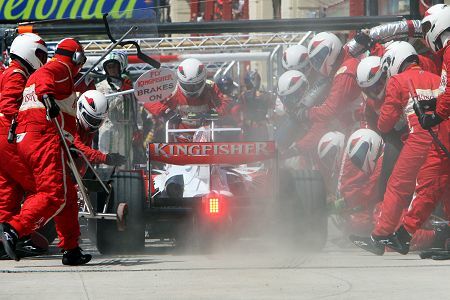 Certainly, drivers, pit lane workers and crewmen KNOW they are at risk when they sign up for the task. The crewmen are already at risk. Stephen Roy: Before you spout any more nonsense about the FIA F1 Sporting Regulations I suggest you actually read them, specifically Article 16, Incidents, numbers 16.1, 16.2 and 16.3 in particular. For your convenience I've appended them below. If there's something in there you don't fully understand please let me know and I'll be happy to explain it to you. - illegitimately impeded another driver during overtaking. more than one car will normally be investigated after the race. 16.2 a) It shall be at the discretion of the stewards to decide, upon a report or a request by the race director, if a driver or drivers involved in an incident shall be penalised. b) If an incident is under investigation by the stewards a message informing all teams which driver or drivers are involved will be displayed on the timing monitors. Provided that such a message is displayed no later than five minutes after the race has finished the driver or drivers concerned may not leave the circuit without the consent of the stewards. and then re-join the race. c) a drop of ten grid positions at the driver’s next Event. However, should either of the penalties under a) and b) above be imposed during the last five laps, or after the end of a race, Article 16.4b) below will not apply and 25 seconds will be added to the elapsed race time of the driver concerned. I think it's important to remember that the pit lane is not intended for racing; if it were, there would be barriers between the lane and the mechanics, marshals waving flags, run-off areas, etc. Effectively, the race stops at the entry to the pit lane and begins again at its exit. Any reference to lapped drivers having to give way to leaders is totally missing the point, therefore - that is a rule for the track, not the pit lane. The primary concern with the rules governing pit lane procedures is safety: how to get 18 cars in and out of the pits without crashing into each other or running over mechanics. Motor racing is dangerous and these events will always occur but that does not mean we should give up on our attempts to minimize the danger. The rule regarding safe release of a car from the pits is one of the most obvious and sensible rules left in the book. If we are going to start applying it differently according to who the drivers are, their positions in the race and whether or not an accident happens, then we negate the rule entirely - it might as well not exist. Ferrari released a car directly into a passing car. End of story. Equally, there is no point in setting down penalties for specific offenses if the stewards are going to do what they like anyway. The offense was committed, there is no argument about that. One of the specified penalties should have been applied - it's as simple as that. Green Flag: The incident in question is covered by the phrase "constituted a breach of these Sporting Regulations or the Code". How you can argue against that, I do not know. The rule is in the regulations, it was breached. As a F1 non-fan who couldn't give a stuff who wins out of McLaren and Ferrari I'll give you an outside perspective. It is obvious to the rest of the automative world that the FIA is biased towards Ferrari. The rules you show are those that normally apply apply for any incident in a pit lane and the penalty applied is usually one from 16.3. Like everyone else I assumed normal procedure had been followed. I should have known better. The following link shows the penalty notice http://www.f1fanatic.co.uk/wp-content/uploads/2008/08/eur_08_document_411.gif and shows that Ferrari were penalised under article 23.1 of the 2008 F1 sporting regulations which has absolutely nothing to do with incidents and conveniently doesn't specify any penalties so the stewards can do what they like. Not quite right, Steven. Article 23.1 is the regulation that was breached by the Ferrari release of Massa into the path of Sutil. It therefore becomes an incident as defined in article 16.1 and should receive one of the designated penalties. The FIA have identified the relevant rule that was offended against but have not followed through to find out the specified penalty. That is an oversight by them and clearly breaks their own rules. At first, i would not say that 10000 euros is a small fine, but of course that is a matter of capabilities to pay it. I would probably have had to sell my soul to the devil to be able to deal with it, but in ferraris courters it might mot have heart that much. And then i would like to comment on the last couple of rows you wrote, and add a retorical question to it. I do not think it would be hearting the championship to have rulebreakers punished acording to what crime they have done or what rules they have broken. I would rather have any team expelled from the championship than having them continue to stretch the rules and trying to redefine whats allowed an whats not. Instead, i think that what happened in Valencia is what really could deal huge damage to the sport, if the audience don't find the judgement from the FIA officials trustworthy from race to race. For example, there was a situation in the F2-race om saturday that had exactly the same course of events, except that the judgement was dealt out immediately. So why should F1 be treated in another way? And as you said, had it been another team i doubt it would really have been. It's really sad, and i hope for a quick change in that department of FIA. I, too, would find it impossible to pay a 10,000 euro fine, Björn. As you say, however, in F1 that counts as a token amount at best. What I really don't understand is why the FIA doesn't at least try to appear more even-handed. They seem to delight in creating controversy over their apparent bias at every opportunity. *LOL* You're right Clive, it could definitely be one way to start controversy and get F1supporters to get talking, wich in the way of events would spread the interests of F1 outside the fanbase and earn more viewers in front of the television or at trackside. But it is also a very shortsighted way to handle the wish to earn more money. As soon as the new audience learn more about F1, as get to see whats happening and also learn that the organisation governing the sport don't even can govern their own officials in the apropiate manner, there will be even more controversy. This will lead to people abandoning the sport instead, because the feel it is to manipulated acording to where the diferent officials have their bias. And in the end, the only ones who will earn more money are the bloggers of the likes of you, who will get more visitors who wants to have their say and read what pople who loves the sport says about whats happening. Congratulations to you, i think this could result in more money in yopur pocket Clive. Clive and Steven Roy - Article 16.2 (a) clearly states: "It shall be at the discretion of the stewards to decide, upon a report or a request by the race director, if a driver or drivers involved in an incident shall be penalized." The crucial word here is "shall". The stewards decided not to penalize the offending driver, as is their right under 16.2 (a). b) A ten second time penalty. The driver must enter the pit lane, stop at his pit for at least ten seconds and then re-join the race. The crucial words here are "may" and "driver". If the Article 16.3 said "shall" impose, then the FIA would have breached its own rules. The stewards obviously decided not to penalize the driver. Nowhere in the regulations are the stewards prohibited from imposing another or additional penalty on the team. At their discretion they fined the team, who in their judgment caused the unsafe release. By pointing at articles 16.2 and 16.3, Green Flag, you are already accepting that the offence falls within the definition of article 16.1 and should therefore be dealt with before the end of the race. This is the first rule that the officials broke and their action leaves any subsequent decisions by them as highly suspect. They may have used their discretion in deciding what penalty to impose, I will grant you that, but I am already dubious on the value of their discretion for the reason given in the first paragraph of this comment. To then impose none of the penalties prescribed by the rules, despite having decided that an offence had been committed, confirms that the real object of the exercise was to ensure that a race win was not taken away from Ferrari. The invention of an entirely new penalty goes beyond the rule and makes a mockery of it. Clive - After re-reading the "Stewards of the Meeting" report, and Article 23.1(i) which was breached, the Massa-Sutil pitlane incident is not an Article 16 incident at all, and so none of its penalties apply. Basically, the driver was in no way at fault; only the team (the “competitor”) was. The regulations, however, provide no penalty for such an occurrence and came up with what they considered an appropriate fine. This is of course, highly irregular, since no such fine for a team is mandated and Ferrari should protest. Clive – (Previous response corrected) After re-reading the "Stewards of the Meeting" report, and Article 23.1(i) which was breached, the Massa-Sutil pitlane incident is not an Article 16 incident at all, and so none of its penalties apply. Basically, the driver was in no way at fault; only the team (the “competitor”) was. The regulations, however, provide no penalty for such an occurrence and the stewards came up with what they considered an appropriate fine. This is of course, highly irregular, since no such fine for a team is mandated and Ferrari should protest. "Unless it was completely clear that a driver was in breach of any of the above, any incidents involving more than one car will normally be investigated after the race." The incident we are discussing clearly falls within that description and the relevant penalties should apply. Article 23 is a part of the Sporting Regulations and must necessarily be dealt with under the provisions of article 16 therefore. Article 23 describes the rules governing the pit lane, article 16 lists the offences and prescribed penalties. Both have to be considered, whether or not the stewards did so. Clive, if you refer to my previous posts on this topic you'll see that I've explained both issues. Concisely, a) if the matter falls under Article 23, the stewards handled it properly, and b) if it is deemed to fall under Article 16 the stewards still handled it properly. You obviously strongly disagree, even in the face of the black and white regulations and reason. The Ferrari bad, FIA bad, everyone else good mindset runs deep. My opinion when reading Clive's original post was that rules are rules.... you break 'em, you do take the punishment. Building room for discretion in rules like this clearly has it's advantages and disadvantages; there will always be winners and losers (or those that feel that way). I must confess, although my knowledge of the rules is hazey, I'd assumed it would be covered during the race in one of the penalties listed in what I now know to be section 16.3 - so it was something of a surprise to see a different punishment applied. My concern now is around the precedent this sets. With a fine of 10,000E for release alongside another car in the pits, its certainly something to consider if your rival is in the pitlane behind you. I'd win the race and pay the 10,000 thanks very much... sort of makes a mockery of the rules. Maybe a computer controlled system like Ferrari's is the answer but where safe release is judged by FIA computers based on common sense rules of approaching cars. I'd certainly rather see that than any mechanics getting hit due to side-by-side action in the pit-lane. A 10,000E doesn't cover it. "Two mechanics with broken legs, that'll be....." Forgive me, I am being facetious. Please lets not go down the route of adjusting the fine based on damaged caused. Lastly, I could be wrong, but why was this considered a Ferrari error? I thought it to be the case in both the Raikkonen and Massa incidents, that both left their pit box with the red/amber light on - it's driver error surely? I haven't seen any onboard coverage of the Massa incident but my understanding is that he got the green light. The Ferrari system is not automated even though a lot of people think it is. The 'normal' lollipop system requires the guy with the lollipop to check that the four mechanics who tighten the wheel nuts have their hand in the air and that the fuel hose has been disengaged. He then raises the lollipop. The only difference with the Ferrari system is that the four wheel mechanics and the re-fueler press buttons to say they have completed their jobs and then the chief mechanic instead of raising a lollipop presses his button to activate the green light. So the whole thing is just as manual as before. The problem with Massa's stop on Sunday was that the chief mechanic was a little bit ambitious in letting his driver go. From what Martin Brundle said in commentary the re-fueler pressed his button as he pulled the hose and then the hose didn't disengage properly. Kimi expected to get the green almost immediately after the orange and jumped the gun. In principle there is nothing wrong with Ferrari's system but I think someone should be assigned to alert the driver in future to any problem disengaging the fuel hose. That could be done simply by having the chief mechanic holding his hand up to signal to the driver and then confirming the point via the radio. Drivers have in the past reacted to a lollipop being turned over before being lifted so I don't think there is an inherent system fault. Although I much prefer personally to have someone with a lollipop as they can convey a lot more than traffic lights. I liked Ferrari's mirror lollipop that let the driver see the fuel hose. A much more fail safe idea. Steve Roy's comment is interesting provided we believe the FIA is honest about applying the rulebook vis-a-vis allowed engine changes. Judging by the double standards and applications of other parts of the rule book, I wonder why they would expect us to believe they would be honest and transparent about the rest? I agree that the mirrored lollipop was a great idea and Ferrari have only themselves to blame for adopting a system of lights that now proves to be flawed. Although Green Flag seems convinced that the only reason we worry about the FIA's interpretation and manipulation of the rules is that we're McLaren supporters (I'm not - I support BMW), the fact is that we have been given very little reason to believe in the governing body's impartiality over the years. A few decisions that seem to favor Ferrari unduly might be coincidence; the problem is that every year there are more than a few and it is not only McLaren that suffers as a result. As regards the rumors of engine mods giving more power to teams that have exploited the rules, it seems too much of a coincidence that all Ferrari-powered cars were quicker than Renault-powered cars in Valencia. To some extent that can be explained by differences in cars and set up but the relative positions of the Toro Rosso and Red Bull teams make it appear that there is some substance to the rumor. In my opinion, that only serves to confirm that the engine freeze was a bad idea in the first place and is unworkable in practice. Green Flag, you appear to have misunderstood the way the regulations work. They are supposed to be read as a whole book, not just as individual regulations. a) There is no "dealt with under Article 23" though something can breach Article 23. All Article 23 regulation breaches must be dealt with under Article 16.
b) Article 16.3 is extremely clear. It says "The stewards may impose any one of three penalties" (actually, it's four when read alongside the end of that Article, but there you go). There are no alternative punishments. There is no option, in the case of a breach of the regulations where the stewards decide to take action, to give a fine (either on its own or accompanying another penalty). Nor is doing nothing an option (the stewards can only do nothing if they use their discretion under Article 16.2 not to declare guilt in the first place). Either way, the FIA was wrong. Ferrari were either excessively punished or leniently treated by it, depending on your view of the incident. However, only an anarchist or an FIA groupie could agree with the action the FIA took about it. Even a Ferrari fan could not agree, because they would surely argue that the release was OK and no penalty at all should have been given. Alianora: Thanks for having another go at getting Green Flag to understand how the rules work. I had given up in view of his constantly shifting ground. Alianora: 16.2 (a) states: "It shall be at the discretion of the stewards to decide, upon a report or a request by the race director, if a driver or drivers involved in an incident shall be penalized." So although the stewards decided that Article 23 had been breached, which then meant that Article 16 had been breached, they had the discretion not to penalize Massa. Article16.2 (a) clearly permit this. The fine imposed on the team is another matter altogether. Clive: I never said you were pro-McLaren; I said you were anti-Ferrari, which is not the same thing. Clive, thanks for the thanks. You have a good point about Force India, though it also wouldn't surprise me if they were getting what they paid for and therefore not getting the modifications to the ancillary components that Toro Rosso (who are presumably paying more for their customer Ferraris) get. Green Flag, Clive isn't anti-Ferrari either; he's anti-FIA on the grounds of their malgovernance of F1 (of which their handling of this incident is but one small example). The same applies to me (and it would be daft of me to be anti-Ferrari anyway since they supply engines to my favourite team...) It just so happens that this time Ferrari "benefit" from this. I put "benefit" in inverted commas because it dawned on me in the last 24 hours that had Ferrari paid due respect to the unsafe pit lane release rule in Canada (which it would have surely done had that type of incident been penalised consistently and in accordance with the Regulations), Hamilton would have had somewhere to go after his reckless spree down the pitlane other than Raikkonen's gearbox and Kimi and Ferrari would therefore be several points up from their current position in their respective championships. In reality, nobody benefits from this sort of error on the part of the FIA, including the FIA itself. "The stewards may impose any one of three penalties on any driver involved in an Incident"
Only those penalties can be issued which are listed there. The no-punishment and fine options are not listed. The Sporting Regulations are supposed to be read as one ruleset, not as a pick-and-mix display (even if the FIA hasn't figured that one out yet). Article 16.2 a) is there so that the stewards have a get-out clause if they don't spot a given incident during the race, or disagree with someone else over the amount of evidence involved in an incident. The fine is part and parcel of the problem. Teams cannot be given a punishment that is outside the scope of the FIA to issue for a given incident. Alianore – Article 16.2 states that the decision to penalize or not penalize a driver, even if the stewards decide that the driver has breached 16, is within the stewards’ discretion. 16.3 provides the penalties that may be imposed should the stewards decide to penalize the driver. With regard to the Massa-Sutil incident the stewards, at their discretion, decided not to penalize Massa, so 16.3's penalties were not required. Please re-read the above as often as necessary until you understand it. Green Flag, since you do not appear to have understood what I've already told you with regard to the incompatibility of the interpretation of Article 16.2 you are using with Article 16.3, re-reading what you have said isn't going to assist matters. Article 16.3 simply does not allow "no punishment" as an option, nor does it allow "fine the team $10,000" as an option. Article 16.2 has to be compatible with the wording of 16.3, otherwise both rules would be legally non-functional. As a result, the FIA would be powerless to punish any infraction of the rules, except for those where it has provided a specific alternative punishment. If the FIA wished to justify their actions based on your thinking, it would be necessary to modify the wording of Article 16.3 (either by explicitly having "no punishment" and "fine the competitor $10,000" or by having a catch-all phrase such as "the stewards may impose any penalty they see fit at their discretion, or none at all") or convert the entire Sporting Regulations rulebook from a standard egalitarian/flat-structured document (when all rules apply equally) to a heirarchical/tree-structured document (when rules only kick in when a rule on the level above makes the rule applicable). As it stands, the FIA has no such get-out clause, given that they have declared Ferrari guilty of an unsafe exit. (Of course, if they'd ignored the incident, or investigated with a "not guilty" or "insufficient evidence" verdict, they could have used Article 16.2 with impunity). The alternative is that specific punishments or non-punishments are appended to Article 23 (i) that may be used instead of those in Article 16.3. However, since Massa's exit involved putting two wheels into the FIA garage area (which is against Article 26.1 e) when done without permission by someone who is neither an FIA official nor a scrutineer), one would have thought that a consistent and completely observant steward would have noted that Massa was in line for two penalties under Article 16.3. This indicates why it would be a very long job for the FIA. Although it would be desirable to append one penalty to each possible regulation breach, I cannot see the FIA being bothered to do the task. Alianore - While I do appreciate the time you have taken to explain your "take" on the regulations, and although I assume that you are sincere and that you truly believe what you've written, you're interpretation is not correct. 16.2 does allow the stewards to find a driver guilty of an infraction and yet not impose a penalty. There is no other reading of that clause and it is in no way incompatible with 16.3. In point of fact 16.3 flows smoothly on from 16.2. Your interpretation is strongly colored by the outcome you would have preferred. While your pique is understandable, the rules are what the rules are. Just so you are aware, Article 16 applies only to drivers, not to teams, and its penalties can only be applied to drivers. The fine imposed on "the competitor", the team, was therefore imposed under Article 23, and although such a fine is not mentioned in 23. Green Flag, if rules contradict themselves, then they are technically and legally invalid. Your interpretation of Article 16.2 contradicts Article 16.3's wording. You have yet to explain how it is possible to interpret Article 16.2 as permitting a choice of penalty other than those delineated in Article 16.3. The reading of Article 16.2 I am using is pretty straightforward. I read it as meaning "the stewards are responsible for deciding whether a driver or competitor is guilty of a breach of the regulations when the clerk of the course tells them about an incident (or the stewards spot an incident themselves)". This makes 16.2 completely compatible with 16.3. The reading you are using appears to be along the lines of "the stewards can choose any or no punishment however they like". This is not compatible with Article 16.3's prescribed list. In stating "The fine imposed on "the competitor", the team, was therefore imposed under Article 23, and although such a fine is not mentioned in 23", you have implicitly indicated that the penalty list is being ignored. Since it is impossible to take a penalty from Article 23 (as you have said), then it demonstrates that the FIA are indeed making things up as they go along instead of consulting their own rule book. So the logical conclusion of that statement is that we both agree that the FIA broke its own regulations. Article 16 applies to everyone. That is made very clear in Article 2, which requires all competitors to obey the Sporting Regulations. Article 16, in any case, only defines an incident as "an event involving one or more drivers". It doesn't say anything about only the drivers being the only ones who can be penalised by the regulations. And if it did, it would have been even more against the regulations than it actually was for the FIA to fine Ferrari for the unsafe release of Massa. For in the FIA's eyes, a "competitor" is a holder of an FIA entry, which means a team. Personally, I would have preferred a logical outcome. Any logical outcome is preferable to the illogical outcome that the FIA have created. So claiming that my view is strongly coloured by my preferences won't work, and will instead be interpreted as an ad hominien argument. Alianora - For the last, absolutely final time: 16.2 (a) states: It shall be at the discretion of the stewards to decide, upon a report or a request by the race director, if a driver or drivers involved in an incident shall be penalized. ---- It’s perfectly clear: the stewards get to decide if a driver involved in an incident shall -or shall not - be penalized. It's there in black and white, perfectly clear English. If the stewards do decide to penalize the driver then 16.3 provides the only penalties available. The stewards must then decide which penalty they'd prefer. If they decide not to penalize the driver (16.2 undoubtedly permits this decision) then 16.3 is unnecessary. There is no other reading, even though you stubbornly stick to what you want to see. The vast majority of the English speaking F1 world, including McLaren, understand the ruling as I have explained it. But if you and a few others on this blog insist on some other interpretation, knock yourselves out – it’s a free world. Firstly, apologies to any bystanders who are still following this dispute. I didn't think it would take so long to resolve. I am putting this long comment in in the hope that it has educative value for those reading this afterwards. If it sways Green Flag, that's a bonus at this point. 1) Possibility. This is how you are interpreting the word as it appears in Article 16.3. 2) Permission. This is how I am interpreting the word as it appears in Article 16.3. 3) Contingency/concession. Usually applicable only to multi-phrase sentences, and in the case of Article 16.3, it appears to have the same effect as 2). 4) Wishing/praying. We can safely rule that definition out of the running for this particular sentence. 5) Expression of ability or power. Since this is archaic, we can rule that out as well. 1) It would render the ruleset null and void because if punishments can be issued for anything, they become arbitrary, in which case competitors are no better off following the ruleset than they would be by totally ignoring it and doing their own thing, at least from a regulatory point of view. 2) It contradicts Article 16.1, which specifies a limited number of things for which a penalty can be issued. As already discussed, if two rules contradict each other, neither has legal force. This is clearly not what was intended. "The stewards are permitted to impose any one of three [four] penalties"
This changes the meaning of Article 16.3 substantially. Only four penalties are possible, so the "any response" problem is negated. However, there is still an incompatibility problem with Article 16.2 if Green Flag's interpretation of it is used. Article 16.2 provides no differentiation between innocence and guilt. Article 16.3 has to bridge that gap, which it doesn't. So you have an arbitrary punishment problem, albeit one where only four punishments can be arbitrarily imposed. It still nullifies both Article 16.1 and the ruleset. Also, a regulation that says the stewards can punish or not (Green Flag's 16.2) as they like is incompatible with one that says they can't (Interpretation #2 of 6.3). This is also clearly not what was intended. Therefore, some interpretation of Article 16.2 other than Green Flag's is necessary to preserve the integrity of the ruleset. Possibility: As per "permission" with Green Flag's interpretation. Permission: Removes the arbitrariness issue without impairing the validity of the ruleset in any other way. That is why I've been arguing for the particular interpretation of Article 16.2 I have - because no other valid options have presented themselves. Green Flag, you still haven't attempted to resolve the incompatibility issue between your interpretation of 16.2 and 16.3. Nor have you explained why my interpretation of 16.2 is invalid. Therefore the discussion has advanced no further. Re-stating a position that has already been demonstrated to be seriously flawed without repairing those flaws isn't going to convince anyone of the validity of the position. The vast majority of the F1 world appears to agree with me. It's only the (silent, possibly due to their knowing how tetchy the FIA have been of late) F1 paddock and two commenters (you're one, Jordan Allen of Sidepodcast is the other) who I've seen go for a different interpretation once the rules have been explained to them - and even Jordan agrees that fining Ferrari wasn't an available option. So telling me the vast majority of the F1 world disagrees is not only dodgy arguing technique (argumentum ad populum, to be precise) but very likely not even true in this instance. I hope I speak for the rest of those also still reading this, but thank you both for a very interesting discussion... Its a privilige to read the opinions of people that know and understand this all so well. I think in this case Alianora has hit the nail on the head in that it boils down to how you interpret the word "may".